Have you ever browsed a real estate website only to find yourself revisiting the same search over and over? You maybe check back weekly, if not daily, to keep tabs on which homes are for sale. You look to see if the ones you favorited have lowered their price or not. You watch for any new properties that match your tastes. Over time, it becomes a hunt. In this article, we’re going to present you with three neighborhoods that are worthy of that hunt. Neighborhoods that will excite you and meet all the demands you have, because we know finding the best home is sometimes about finding the right neighborhood.Here are the neighborhoods that make our top 3 list. With any search around Arrowhead, you’ll find a variety of sub-neighborhoods that leverage the name and collectively create this special community. 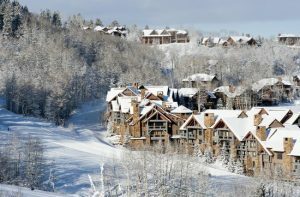 Serving as the western gateway to Beaver Creek Mountain, you’ll find access to the ski slopes a luxury you wish you had all the time. Clubs in the area grant every amenity you can think of, and if you’re looking for a neighborhood that truly doesn’t compromise on any attribute, this is where to start your search. Real estate in the area ranges from spacious cabin-style homes to luxurious condos. Practically any need (or want) can be served by the Arrowhead community. Click Here to View Arrowhead Homes for Sale. If you’ve ever felt immediately drawn to the mountainside and always wanted a residence on the hill, look no further than Bearpaw Lodge in Beaver Creek, CO. Condos for sale in this neighborhood give you all the amenities without the upkeep of a traditional home. Bring your mountain gear, settle in, and soak in the majestic views of the mountains. Ski access is literally minutes away. Or you can cozy up next to the fireplace and be closer to nature than you’ve ever been before. Click Here to View Bearpaw Lodge Condos for Sale. You can easily use one word to describe the Lion community: Regal. 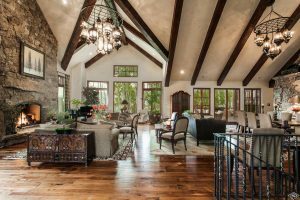 Following the nature of its iconic name, you can expect every modern amenity outfitted to the outdoors lifestyle of Vail, CO. Open living areas provide elegant spaces to host guests and parties. Expansive windows offer unrivaled views of Colorado’s mountainside. The construction here lends to smart and futuristic efficiency, years ahead of most other buildings in Vail. And the list goes on. If you’ve been looking for a property situated in the heart of Vail, with quick access to the slopes, but with a touch of modern design, then the Lion is where you should look. To view properties for sale at the Lion, click here. If you’d like to learn more about other neighborhoods in Eagle County, don’t hesitate to contact us at The Smits Team or call us at 970-668-2121.